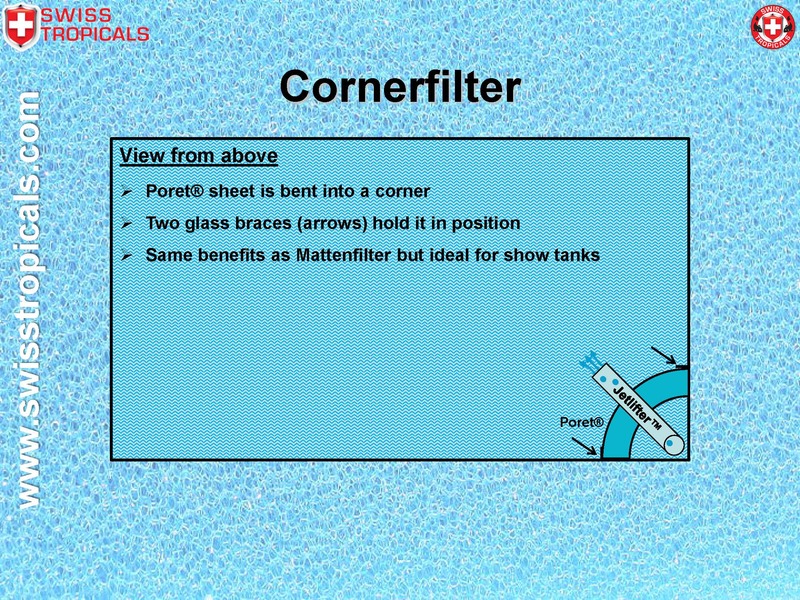 The Cornerfilter is a sleek version of the Mattenfilter. 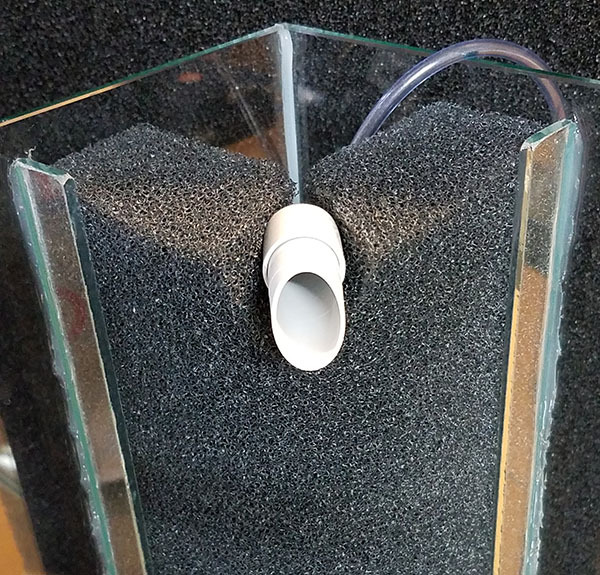 Instead of a straight foam sheet, the filter is built into a corner to improve the look, especially for aquariums in the living room. 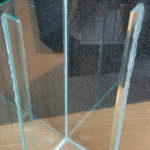 Using glass braces has proven the best solution for a glass tank. Plexiglas, acrylic, plastic, or metal strips do not work well because no glue bonds to these materials and glass at the same time. Long term exposure to water will weaken the bond between the braces and the silicone, even for aluminum, which I have tested for 6 years. 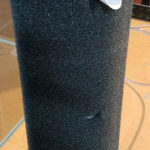 Do not underestimate the pressure of a bent or squeezed Poret® foam sheet. When a brace fails, the tank has to be completely drained for reinstallation, which is rather painful. 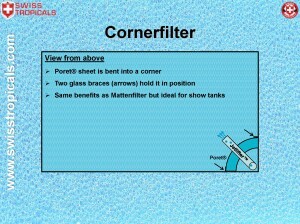 Check out the Cornerfilter layout as a pdf. 1) Wipe the area clean with cleaning ethanol from the hardware store diluted with water. 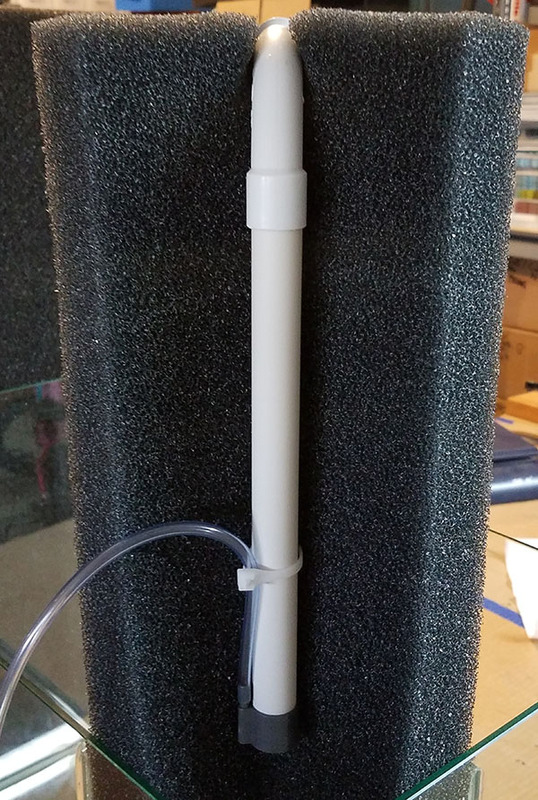 2) Mark the position of the braces 4-8″ away (depending on the size of your Cornerfilter) from the corner on the outside of the tank with a permanent marker (so you can wipe it off after installation). 3) Laying the tank on its side for gluing makes it easier, if possible. Dry-fit the brace first, so you know it fits. The cut-off corner on one end of a brace allows for the silicone seam at the bottom. Take the brace out again. 4) Put a bead of silicone on the side of the brace and glue it in. Hold it for a few seconds, it stays put. Let the silicone cure for at least 6 h. Glue in the other brace. If you smear silicone anywhere by accident, wipe it off with ethanol immediately. You can also mask the area with masking tape for easier cleanup. 5) To create clean seams put another bead of silicone on each side of the braces and smoothen with one swipe using a finger. Make sure you silicone the bottom end tightly, so that the braces cannot swing like a hinge. Clean seams prevent algae from growing into the seams and give it a neat look. Let cure for at least 24 h before you fit the foam; otherwise, the pressure could move the braces. 6) Bend the foam into the corner, and cut a groove where you want to place the Jetlifter. It is important that you cut the groove when the foam is bent, otherwise it will become too wide on the outside radius. 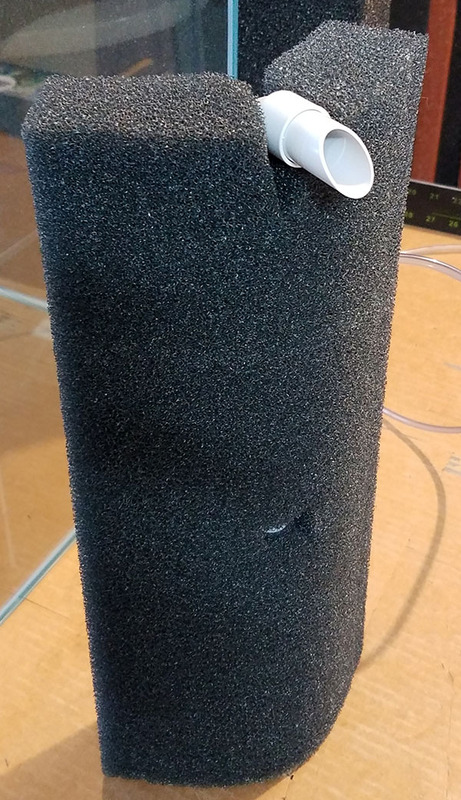 Fix the Jetlifter with a zip-tie that you push through the foam from behind to hold it (see images). You do not have to remove the zip-tie to clean the foam, just slide the Jetlifter out before rinsing. 7) Ready to go! Place the heater or other equipment in the space behind the corner, so it is out of sight. Now you have a neat filter that will run for many years. Rather than taking the Cornerfilter out for rinsing, just occasionally vacuum off the front with a hose when you do water changes. Summary: For ~2 hours of setup work you save countless hours of dismantling power, canister, sponge, or hang-on-back filters, cleaning out pump drives and hoses, and buying new media all the time. Moreover, you will not have a sponge filter sitting in the middle of the tank. Simplicity that works! Note: The braces need to cover the whole height, so the water does not bypass the foam. However, make sure they fit; you cannot easily trim off ¼” from a glass brace if it is too long. Glass braces are much better than any plastic or metal, since silicone does not bond to plastic or metal long term. Moreover, the all-transparent look makes it really look slick. 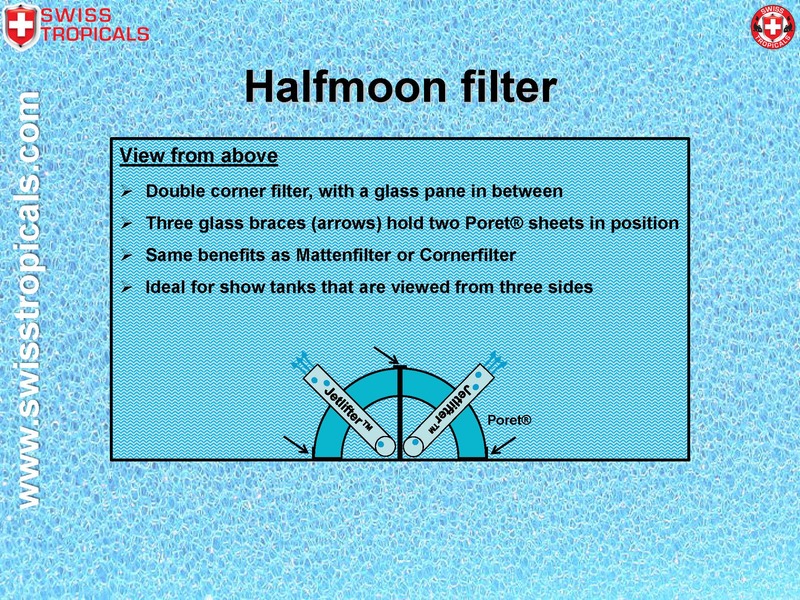 The Halfmoonfilter is the Rolls Royce of the Mattenfilter. 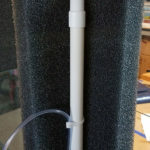 Instead of a straight or corner foam sheet, the filter is built onto the back of the tank. 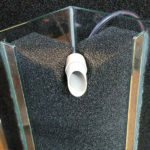 Ideal for show tanks that are viewed from three sides, especially for show tanks in the living room. No hoses, sumps, overflows, bulkheads or similar to worry about leaking. 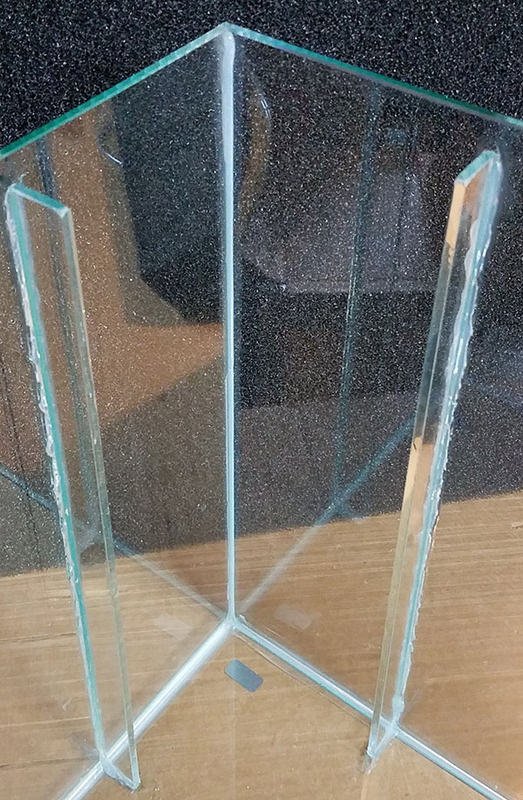 Simply glue in a pane of glass (¼”) from the hardware store. I can supply the glass braces, Poret® foam, and Jetlifters™. Two hours of work later, you will be pleased to have a Halfmoonfilter taking care of your fish. All the benefits of a Mattenfilter built into the back of your show tank. 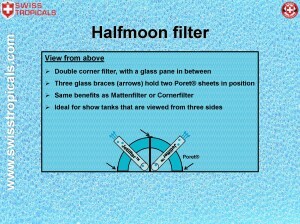 Check out the Halfmoonfilter layout as a pdf.